This Security Slide-Action Promotional Webcam Cover gives you extra peace of mind and privacy. It adheres to most devices easily with strong adhesive. [MOVABLE SLIDER DESIGN]: Nano-Shield Webcam Cover can be opened or closed with just one simple finger movement. The adhesive can be easily applied and removed from the required device without trace. [EXTREMELY THIN AND DURABLE]: Measuring only 0.03in thick, will not interfere with closing your laptop. Adheres with double sided tape, can be removed if needed but will stay on strong through wear and tear. [SECURE YOUR PRIVATE SPACE]: Nano-Shield Webcam Cover ensures your private life behind the laptop remains private. Slide the Webcam Cover open when needed, block potential hackers and close your laptop with no problem due to the ultra thin design. [ABS MATERIAL]: Our Webcam Cover is made out of a dense high quality ABS plastic that it has heat resistance, durable and good toughness. 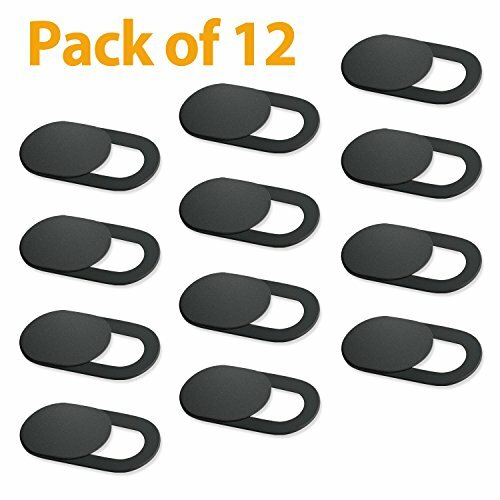 [FITS ON MOST DEVICES]:Can be used to cover most webcams on Computers, PS4, laptops, and tablets. Does not interfere with webcam use or indicator light. If you have any questions about this product by Nano shield, contact us by completing and submitting the form below. If you are looking for a specif part number, please include it with your message.